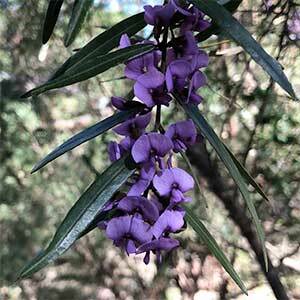 Bright purple flowers from winter into spring make Hovea longifolia or Long-Leaf Hovea a welcome addition to the garden. This is a medium too tall shrub reaching around 2 – 3 metres in height. The foliage is lanceolate as the common name suggests and the growth habit is open. Purple flowers appear in long clusters and do have the typical pea-shape. The stem have an indumentum (covered with fine hairs) which give the plant an unusual look. Found from New South Wales to Queensland this is an adaptable plant and will grow well as far south as Melbourne. This is a plant that grows well I’m a range of soil types as long as drainage is good. It can be light pruned after flowering and will grow in light shade. Height – Will reach around 2 – 3 metres.